The International Space Station is featured in this image photographed by an STS-133 crew member on space shuttle Discovery after the station and shuttle began their post-undocking relative separation on March 7, 2011. Launch $1-billion-worth of spare parts to the International Space Station, and you can keep Earth's orbital outpost going for another decade. Send up some 3D-printing devices, and you invest in the ability to build everything on demand in space: space-station parts, astronaut tools, satellites, even spacecraft. A first step toward space factories may come from NASA's recent selection of a U.S. startup's proposal to build a 3D printer for the space station. Such printing technology could build any number of objects, layer by layer, based on designs uploaded from mission control. Astronauts would only need "feedstock" material, such as plastic or metal, to make new tools or spare parts on the fly. "When a tool breaks, at the very worst the space-station crew calls Houston and says, 'Send us a CAD (computer-aided design) file of that tool,' and they'll be able to 3D-print it," said Jason Dunn, chief technology officer and cofounder of Made in Space, Inc. "Ideally, one day they'll be able to design it themselves." Made in Space working in Houston, TX at NASA Johnson Space Center for microgravity testing. Made in Space members in the photo include Jason Dunn, Brinson White, Mike Snyder, Alison Lewis, Adam Ellsworth, and Aaron Kemmer. Made in Space came out of Singularity University — a school for startups aimed at solving the world's biggest problems. It chose to locate itself at the NASA Ames Research Park in Moffett Field, Calif., near Silicon Valley. The founders estimate that printing parts in space could reduce the structural mass of objects by at least 30 percent, because the objects would not need to survive Earth's gravity or the extreme G-forces of launching into orbit aboard a rocket. "Our long-term goal for 3D printing is to actually build functioning spacecraft," Dunn told InnovationNewsDaily. "A Cubesat (miniature satellite) could be built with the machine we are designing for the space station in the next several years." First, the company must create a 3D printer that works well in the seemingly weightless conditions of space. It used past NASA funding to test a prototype and several commercial 3D printers during two hours worth of stomach-churning aircraft dives meant to simulate microgravity. Such printing runs led to the world's first tool — a small wrench — ever printed in partial gravity. Made in Space team members Adam Ellsworth, Brinson White and Jason Dunn wave to the camera while testing multiple 3D printers in zero-gravity. The tests eventually convinced Dunn and his team to go with their own custom printer design. 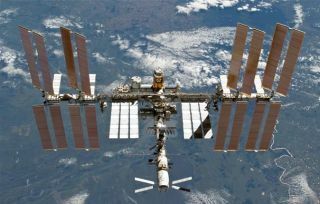 They plan to focus on an extrusion printer capable of building objects out of plastic polymers, but say that the printer could still make a huge number of the space station's $1-billion-worth of spare parts. "We think that one-third of those parts could be built using the machine we're building right now," Dunn explained. "We're starting with polymers because they're extrusion-based, and in some cases we're starting to produce our own space-qualified polymers." The company's Small Business Innovative Research proposal — submitted with Arkyd Astronautics, Inc. and NanoRacks, LLC — makes the project eligible to receive up to $125,000 in NASA funding sometime next year. If all goes well with upcoming parabolic and suborbital flight tests, Made in Space could see its first 3D printer reach the space station by 2014. This story was provided by InnovationNewsDaily, sister site to SPACE.com. You can follow InnovationNewsDaily Senior Writer Jeremy Hsu on Twitter @ScienceHsu. Follow InnovationNewsDaily on Twitter @News_Innovation, or on Facebook.